Ian's elder sister, Marilyn Court (nee Anthony), also contributed. 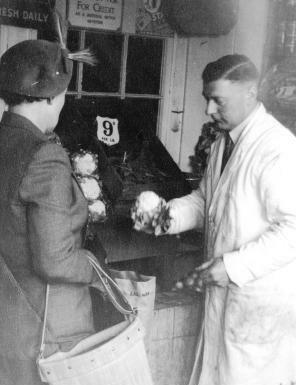 During the 1950s my parents ran a greengrocery business from No. 326 the High Street and I thought you might be interested in my recollections. I was born in 1955 and some of my earliest recollections are being in the shop with my parents. My sister, who is 9 years older than me, has much clearer memories of the business and the high street at that time. She believes my parents opened the shop in late 1953 (it was open for Christmas but at the time of the Coronation my father was still involved in the family greengrocery stall in the Portobello Road in North Kensington). We did not live above the shop but in a flat a few miles away in Acton. The first photo shows John Anthony, my father, serving a customer. Marilyn:'The flat over the shop was inhabited when my parents first took over the shop. The son and daughter-in-law of the Pinks, who ran the eel and pie shop next door, and their family lived over our shop. They kept a big Alsatian dog in the yard which terrified me when I had to pass it to use the outside toilet. Ian: I remember the upstairs of the shop was uninhabited and it being very dark and quite scary up there ! My mother recalled finding some plaques upstairs which turned out to be "fire tokens" probably from the late 18th century. Apparently they would have been fixed to an outside wall to show that the owner had paid for fire protection. I understand they were donated to the London Museum. 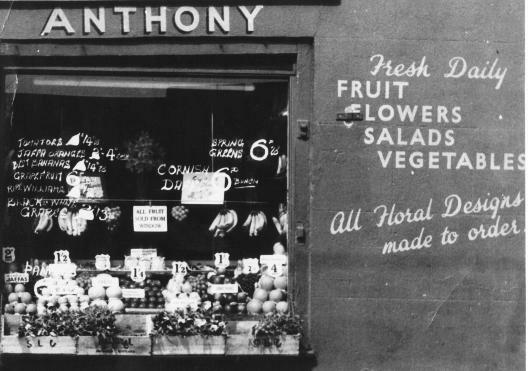 The exterior photo shows good for sale included choice Jaffas, fresh roasted peanuts, Canary tomatoes, best bananas, ripe Williams and Cornish daffs: the latter suggest the photo was taken early spring. The sign in the window says 'All fruit sold from window'. My parents ran the business until, I think, July 1960 when the business was bought by the council so that that part of the high street could be re-developed. I remember, when I was older, driving along that part of the high street with my father and him telling me that we were driving over the site of the shop as we passed the Red Lion. The buthers shop I think call Bovingdon's and the son who I think was called Peter and was a few years older than me (could be the Bovingdon family at 325? ); Marilyn 'I clearly remember the Bovingdon’s butcher’s shop. They had two children, Peter, who Ian remembers and also a daughter Peggy who was about my own age. This meant that I had someone of my own age to play with instead of spending most of my time with my baby brother'. One anecdote, partly remembered and partly from re-telling late was the fire at the Gas Works on a Saturday afternoon. The shop was closed for lunch and my grandfather, who was helping with the business at the time said ther must be a big fire somewhere because of all the fire engine bells he heard whilst eating his lunch. When he went out to re-open the shop, he was very suprised to see that it was the gas works directly opposite the shop which was on fire !